Ellen McCullom has been part of the United States Mint team for the past 43 years. She has been the Superintendent of the United States Mint facility in West Point, NY since 1999. Ellen began her career in 1975 as a laboratory control technician at what was then known as the U.S. Bullion Depository at West Point. She was promoted to a Contracting Officer position at the Procurement and Contracting office at the New York Assay Office in lower Manhattan. During the closure of the Assay Office in 1982, Ellen transferred to the U.S. Mint Headquarters office of Procurement and Contracting. In 1984, Ellen was selected as the Administrative Officer for the West Point Mint. She served in that capacity for approximately 15 years. She was also asked to serve as the Acting Production Manager. In 1999, Ellen became the Superintendent of the West Point Mint. 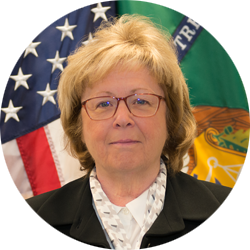 She oversees the world’s largest production facility of gold, silver, and platinum bullion and numismatic coins as well as serving as the custodian responsible for storage of almost 25% of the Treasury’s gold reserves. Ellen graduated from Mount Saint Mary’s College in 1973 with a Bachelors of Art in History and Political Science.